But ofcourse, since Inoue doesn't like Ichigo all that much whilst him being Viking, he can't fully use his power anymore. That guy really needs to work on his self esteem. It gets a bit boring though, not the first time they did this. Raw power against raw power again, should be fun next time Kenpachi fights. should be fun next time Kenpachi fights. You know, it just dawned on me. The reason I continue to read Bleach is because I want to see Kenpachi's Super Saiyan transformations, but at the same time I'm curious how long they can go without him having to do a transformation. 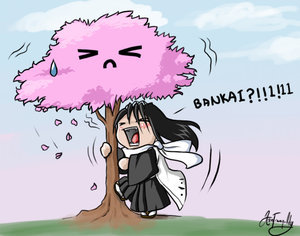 If it does happen, I hope it isn't something silly like Byakuya's. That is definitely high on my wish list too, just to see what exactly his bankai is going to be like. Not sure if they're ever going to go there though, heck, they're happey with him just holding his sword with two hands. We dunno if Kenpachi even got his sword's name yet, heh. Aside from deus ex machina, we know he doesn't know it. Man, I actually started reading the manga, and I really wish I had started earlier. It's nice actually getting to see stuff happen. I agree with everyone. One of the reasons I continue to read is because I want to see more Bankai's Especially Kempachis. It does sort of make me mad that at times characters can seem super weak and then super strong. I hope the Yammy fight can get over with and Ichigo and the others actually get to Aizen. New anime intro implies the filler is going to last a lot longer than I expected. Fine by me. Keeps the anime separate from the manga and I actually think this filler is kinda interesting. Will we get to see Unohana kick some ***** IT's about time she showed that she is canonically the second most powerful captain. I'm thinking Unohana may just go up against Aizen himself, as the two of them seemed close-ish before the plot twist revealed him to be the villian. EDIT: Hur dur, learn to read the posts above mine. Stupid Fishy. So far it's pretty good, fun. I do still feel that they'll mess it up soon though lol. Well I'll give the Bleach author credit. He came up with a very reasonable explanation why Kurosaki has to be "The One." Certainly reasonable, but how he executes it is probably going to be outrageous. Still waiting to see how he could possibly overcome the gap in power without going to SSJ20 =/. It's probably going to have something to do with his new hollow mask / Vasto Lorde form / whatever you want to call it. Yeah, it lets him be the only possible saviour without making him vastly more powerful than everyone else. ...Pity he already made Ichigo vastly more powerful than everyone else with his second mask, eh? Ichigo has yet to fight anyone who i would deem "extremely powerful". I mean he defeated the 4th espada, but that's really it. It should be noted that at least 4 captains, Aizen, Gin, Tosen, and a handful of others were significantly stronger then Ichigo before he got his second mask. Yeah, they probably are now, due to plot strength. Ulquiorra's Second Form, if only because his aging powers were just plain broken. Ulquiorra's second form was powerful, but you also have to take into account who Starrk and Harribel was fighting. Starrk was fighting an extremely powerful captain, with an extremely broken ability. Still, the fact that Rose and Love both had a hard time against him said somethign. Harribel's ability was kind of countered by Toshiro because they in essence had a very similar power, Toshiro is probably the smartest fighter of all the captains. Barrigan had a strong ability, but Soi Fon was a very melee centric character, which is a poor match up. It was easy to defeat Barrigan once you knew the flaw to his technique. There's no point talking about this, because their power levels change drastically based on how strong the plot needs them to be, because the writer is awful at writing. Kenpachi, for example, had to use a two hand grip to cut axe-espada at all, but now he's slicing through 0, who's supposed to have iron skin as one of his main abilities, as if he's made of butter. Did he even take off his eye-patch yet? I don't think he did. Do we even know if he even really is as powerful as he claims to be? He's getting sliced up much more easily than the other espada as you said. Is he just erasing his "1" because he thinks he is that powerful and none of the others are around to kill him over it?